Latin or Roman script, is a set of graphic signs (script) based on the letters of the classical Latin alphabet. This is derived from a form of the Cumaean Greek version of the Greek alphabet used by the Etruscans. Several Latin-script alphabets exist, which differ in graphemes, collation and phonetic values from the classical Latin alphabet. The Latin script is the basis of the International Phonetic Alphabet and the 26 most widespread letters are the letters contained in the ISO basic Latin alphabet. Latin script is the basis for the largest number of alphabets of any writing system and is the most widely adopted writing system in the world (commonly used by about 70 percent of the world's population). Latin script is used as the standard method of writing in most Western, Central, as well as in some Eastern European languages, as well as in many languages in other parts of the world. The distribution of the Latin script. The dark green areas show the countries where the Latin script is the sole main script. 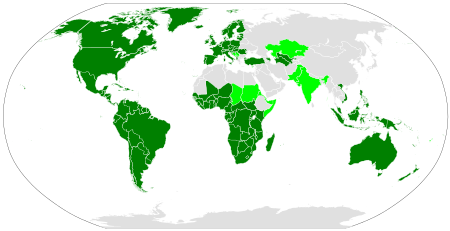 Light green shows countries where Latin co-exists with other scripts. Latin-script alphabets are sometimes extensively used in areas coloured grey due to the use of unofficial second languages, such as French in Algeria and English in Egypt, and to Latin transliteration of the official script, such as pinyin in China. In 1928, as part of Mustafa Kemal Atatürk's reforms, the new Republic of Turkey adopted a Latin alphabet for the Turkish language, replacing a modified Arabic alphabet. Most of the Turkic-speaking peoples of the former USSR, including Tatars, Bashkirs, Azeri, Kazakh, Kyrgyz and others, used the Latin-based Uniform Turkic alphabet in the 1930s; but, in the 1940s, all were replaced by Cyrillic. After the collapse of the Soviet Union in 1991, three of the newly independent Turkic-speaking republics, Azerbaijan, Uzbekistan, and Turkmenistan, as well as Romanian-speaking Moldova, officially adopted Latin alphabets for their languages. Kazakhstan, Kyrgyzstan, Iranian-speaking Tajikistan, and the breakaway region of Transnistria kept the Cyrillic alphabet, chiefly due to their close ties with Russia. In the 1930s and 1940s, the majority of Kurds replaced the Arabic script with two Latin alphabets. Although the only official Kurdish government uses an Arabic alphabet for public documents, the Latin Kurdish alphabet remains widely used throughout the region by the majority of Kurdish-speakers. In 2015, the government of Kazakhstan announced that a Kazakh Latin alphabet would replace the Kazakh Cyrillic alphabet as the official writing system for the Kazakh language by 2025. The letter ⟨a⟩ with an acute diacritic. A diacritic, in some cases also called an accent, is a small symbol that can appear above or below a letter, or in some other position, such as the umlaut sign used in the German characters ⟨ä⟩, ⟨ö⟩, ⟨ü⟩ or the Romanian characters ă, â, î, ș, ț. Its main function is to change the phonetic value of the letter to which it is added, but it may also modify the pronunciation of a whole syllable or word, or distinguish between homographs (such as the Dutch words een meaning "a" or "an", and één, meaning "one"). As with letters, the value of diacritics is language-dependent. English is the only major modern European language requiring no diacritics for native words (although a diaeresis may be used in words such as "coöperation"). ^ Haarmann 2004, p. 96. ^ "Search results | BSI Group". Bsigroup.com. Retrieved 2014-05-12. ^ "Romanisation_systems". Pcgn.org.uk. Retrieved 2014-05-12. ^ "ISO 15924 – Code List in English". Unicode.org. Retrieved 2013-07-22. ^ "Search – ISO". Iso.org. Retrieved 2014-05-12. ^ "Zakon O Službenoj Upotrebi Jezika I Pisama" (PDF). Ombudsman.rs. 17 May 2010. Archived from the original (PDF) on 14 July 2014. Retrieved 2014-07-05. ^ "Descriptio_Moldaviae". La.wikisource.org. 1714. Retrieved 2014-09-14. ^ Kazakh language to be converted to Latin alphabet – MCS RK. Inform.kz (30 January 2015). Retrieved on 2015-09-28. ^ "The New Yorker's odd mark – the diaeresis"